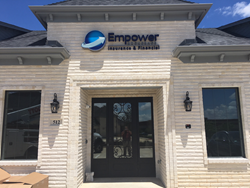 Empower Brokerage, an established Insurance brokerage specializing in Health Insurance, Life Insurance, and Financial Products has expanded to a newly constructed home office in Southlake, Texas. The new office includes many upgrades such as three new conference rooms, a full kitchen, outdoor space, and a 50+ seat training room for seminars. Empower Brokerage, an established Insurance brokerage specializing in Health Insurance, Life Insurance, and Financial Products has continued expansion over the past months. Its latest upgrades are encompassed in a newly constructed home office in Southlake, Texas. The office includes many upgrades such as three new conference rooms, a full kitchen, extended agent space, and a brand-new training room that fits 50+ people. When asked about the upgrades, The CEO of Empower Brokerage, Rodney Culp, stated these improvements would allow Empower to offer a better quality educational experience for consumers and agents. With the new training room facility, Empower Brokerage plans to host an array of seminars. These conferences have been used in the past to help clients/agents become more knowledgeable about available insurance products and solutions. These seminars can cover anything from transitioning into Medicare & saving money on benefits, getting out of debt while building a healthy retirement fund, topics important to business owners, and agent sales training to help them reach more consumers. Empower also stated that their agents will be able to use the training room to host their own seminars and meet with prospective clients in one of the smaller conference rooms, depending on meeting size. Empower Brokerage is known for its national agent opportunity to offer a vast selection of carriers & products. With four new offices in Texas alone, Empower Brokerage continues to expand its support across the United States. When asked how the new upgrades affect everyday life, John Shinn, Empower's Medicare Supplement Product Specialist, stated "the new building is located in a central area of DFW, which is very easy for agents to access. It is just a few miles from DFW Airport and a few blocks from Hwy. 114 in the Southlake / Grapevine area. The area also boasts a large selection of restaurants, shopping, and entertainment for visitors to enjoy." Shinn also stated that the technological advances of the company has made it easier to connect with agents and consumers regardless of their physical location. Since developing its own leads distribution system, called LeadServ, Empower continues to develop better ways to communicate with agents and to help agents better communicate with their clients. For example, Empower University was developed to offer training and education from anywhere in the world, available 24/7 for registered users. The Empower Brokerage ecosystem involves agents with their clients and then provides the education to help them both. As Empower Brokerage grows, so does their book of business. In 2017 alone, Empower released a new mobile app system, four consumer websites, and a brand new quoting system, hoping to provide the best support possible to its agents and consumers. Currently, Empower Brokerage has over 7,000 agents connected and are planning to do an abundance of recruiting throughout the rest of the summer. With over 18 carrier awards, Empower hopes to only improve as the 2019 Annual Enrollment Period begins to kick off on October 15th. Since insurance is oftentimes overwhelmingly confusing, Empower Brokerage offers the tools and resources to help educate agents and consumers. The new Southlake facility will host several seminars and workshops each month, to further this objective. For more information on Empower Brokerage visit their website at https://www.empowerbrokerage.com/ or give them a call at (888)-539-1633.